Summary: The migration issue is not going away, Europeans need an integrated migration policy based on a genuine sense of solidarity. Painfully and hesitatingly, the EU has managed to stem its migration crisis, regaining control of its borders and ensuring a dramatic drop in the flow of migrants. Yet, the migration issue is not going away, and the political debate around it persists. Confronted with populist rises in many member states and the fallout from Britain’s vote to leave the EU, Europeans need an integrated migration policy based on a genuine sense of solidarity. 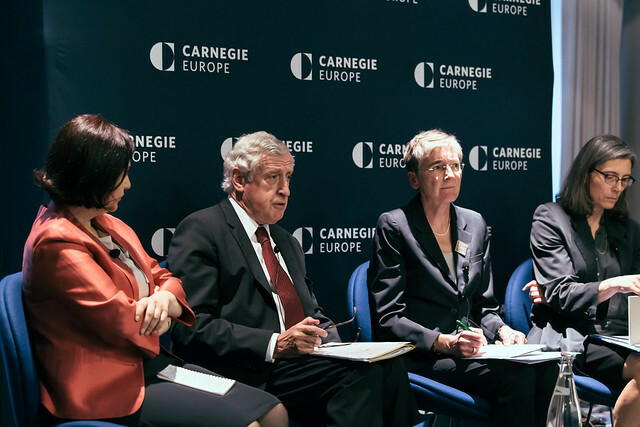 To mark the launch of a new Carnegie paper, “Migration in Europe: Bridging the Solidarity Gap,” author Pierre Vimont was joined for a lively discussion by Arjan Hehenkamp, general director of Médecins sans Frontières—Operational Center Amsterdam, Christine Roger, director general for justice and home affairs at the Council of the EU, and Maha Yahya, director of the Carnegie Middle East Center in Beirut. Judy Dempsey, nonresident senior associate at Carnegie Europe and editor in chief of the Strategic Europe blog, moderated. Arjan Hehenkamp is the general director of Médecins sans Frontières—Operational Center Amsterdam. Follow him on Twitter @Arjan_Hehenkamp. Christine Roger is the director general for justice and home affairs at the Council of the EU. Pierre Vimont is a senior associate at Carnegie Europe. Maha Yahya is the director of the Carnegie Middle East Center in Beirut. Follow her on Twitter @mahamyahya. Judy Dempsey is a nonresident senior associate at Carnegie Europe and editor in chief of the Strategic Europe blog. Follow her on Twitter @Judy_Dempsey. Will the EU Survive the Refugee Crisis?